Summary: Subterranean termites enter homes through "shelter tubes" that the termites construct. Shelter tubes can be built on any support that spans between the building and soil. Inspecting for termites therefore equals inspecting for shelter tubes. Subterranean termite colonies usually start below ground on wood debris left behind during construction. 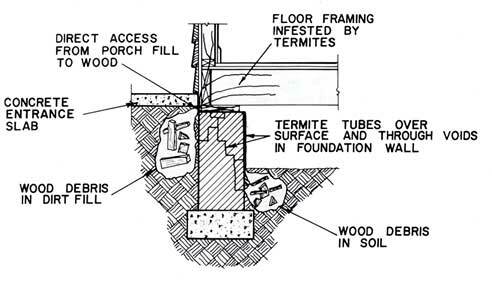 Once inside a structure termites extend the colony by building "shelter tubes" over, or inside, the foundation that spans between the soil and building (see drawing below). In short -- anything that links the soil to the building can serve for termite access. Termites enter houses through a number of "weak points" (right) such as foundation walls and posts. These areas should be regularly inspected for termite activity. Shelter tubes also provide a means to control termites, see Termite Control Options. Subterranean termite entry points. Cross-section through foundation and floor jousts. Notice how the termites start in the soil on wood debris then extend their colony into the structure through shelter tubes ("termite tubes"). Original drawing from Wood-Inhabiting Insects in Houses by Harry B. Moore, 1979. USDA, Forest Service and HUD. Shelter tubes built on a foundation wall (drawing). 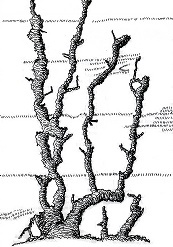 They look like the roots of a tree (upside down).